uuid : fcfb7585-f67b-43a8-93ee-d03562c25020 templates_id: 119580 templates_uuid: "5e293ab8-ddfc-4953-b619-a05296a9f434" title: "Promissory Note - Free Promissory Note Template " display_name: "Promissory note" meta_keywords: "Promissory note form and Note payable form" description: "
If you are a lending or borrowing money use this promissory note to create an unconditional promise to have all debts repaid. Creating a legally binding promissory note means you can feel protected and assured as you have recorded the transaction and set out repayment terms . 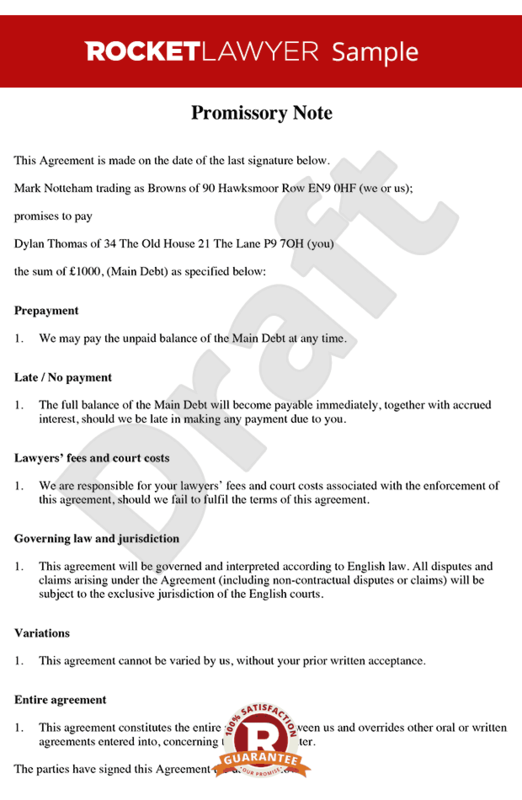 This promissory note will help you outline all the specific terms regarding the repayment, from the parties involved, to the date of repayment and even whether interest is payable. A promissory note records a loan between two parties (it can be one or more companies or individuals). The promissory note sets out when the loan will be repaid, either in full or in instalments. It outlines the specific terms regarding the repayment, including the parties involved, the date of repayment and whether interest applies. Why do I need a promissory note? You need a promissory note if you want to ensure that the debt will be repaid. This note is legally binding on the party that owes the money and properly records the transaction and repayment terms. You can choose to set a date when the loan must be repaid or to order the payment in instalments. This note allows you to clearly state the time of each instalment and the last date on which final payment is made. When is a loan secured? A secured loan is a loan secured by a mortgage or trust deed or valuable item. In this note you can choose to secure the loan by a collateral agreement, i.e. a guarantee or security for payment of loan. Yes, this note allows you set out the interest rate and therefore claim contractual interest on the debt. What happens if the borrower fails or is late to repay the debt?
" created_timestamp: "2018-10-08 04:37:07.0" modified_timestamp: "2018-10-08 04:37:07.0" active: true created_by: 157 modified_by: 157 dcm_id: 249 url_slug: "Debt-promissory-note" meta_description: "Create a promissory note with a simple step-by-step guidance from Rocket Lawyer. Protect yourself by being prepared and outlining specific terms using a legally binding promissory note. Try this promissory note for free." time_to_complete: "10 minutes" role1: "Lender" role2: "Borrower"
If the borrower fails to or is late to repay the debt, the full balance of the total amount becomes payable immediately, including the interest. More than just a Promissory note template, our step-by-step interview and guidance makes it easy to create your document. Easily create online, download, print and sign your free Promissory note in minutes. This document is also sometimes called: Promissory note form and Note payable form.